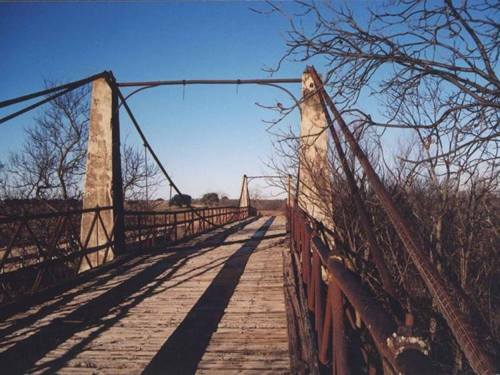 Suspension bridge over the Clear Fork of the Brazos River NE of Albany near Woodson Texas. 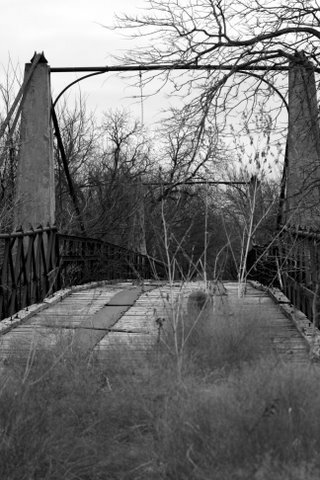 I followed the countryman’s directions to find the suspension bridge. I continued west on 209 four miles beyond Woodson, to the first paved road, State Highway 2850. I drove south on 2850 three miles to where the pavement peters out and forks into two dirt roads. I took the left fork, and followed the road as it led me farther and farther back into the sticks, deeper into a wilderness. 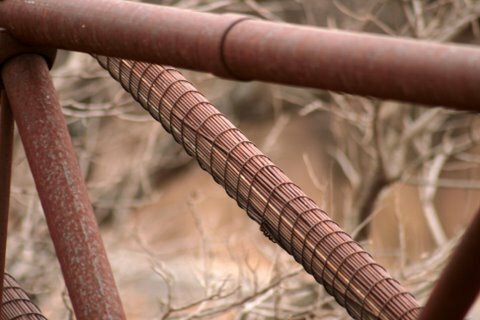 Only the dirt road itself, wide and well-groomed, and a few rusting remnants assured me that this terrain was not totally untamed. The sky, which started out mostly sunny this morning, was now covered with a gray blanket and the temperature was hovering around 35. And I was down to 1/8 of a tank of gas. The dirt road meandered for another 3 miles, then descended into a valley, a sure sign that a river and a bridge are near by. 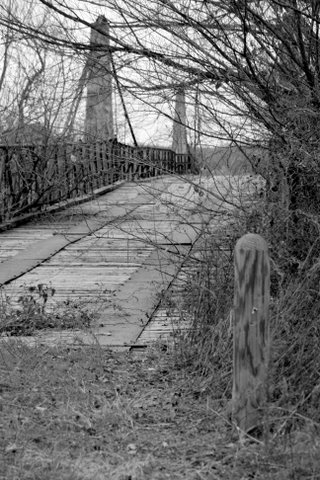 Sure enough, the old suspension bridge, a beauty, loomed into view and next to it a modern slab of concrete with low metal rails, basically a puddle hopper. I was happy to see a farmhouse in the distance. I crossed the new bridge, parked and got out to inspect the relic. 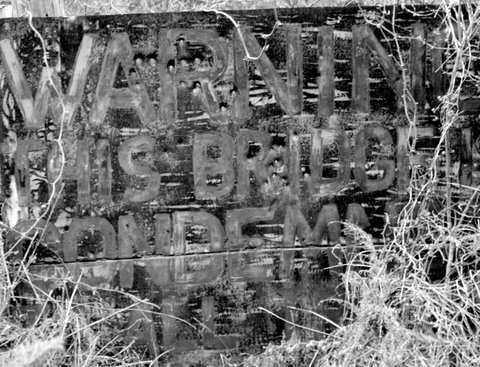 Two very rusted metal signs, one at each end, gave notice that this old bridge is condemned and closed to all trucks, by order of the county court. Posts blocked the entrance at each end, but you could easily move around them to enter the bridge on foot. 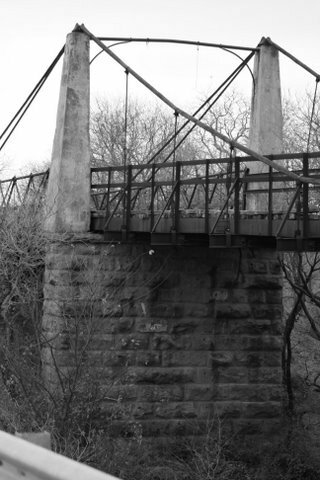 There are no historical markers or any other markers telling when the bridge was built, but the stone pillars supporting it and the bundles of metal wires suspending it lead me to guess the 1890s. 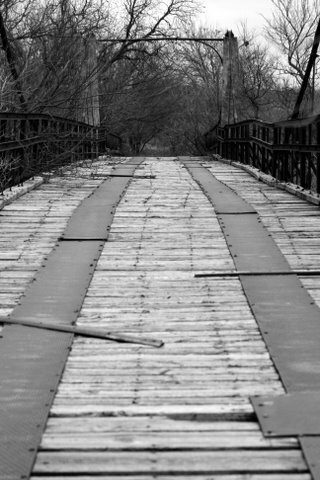 This would put it about the same time as the bridge down by Blue Mound. The deck is mostly sturdy wood, with holes here and there, and two parallel metal strips laying out a track for vehicles to roll across. 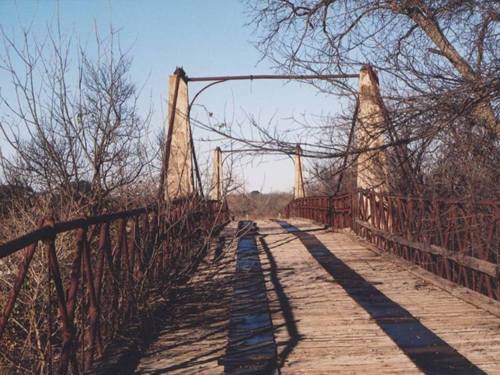 The suspension rigging is not as elaborate as the bridge at Blue Mound, but given that so few suspension bridges are still standing in Texas and this one is so out of the way, it is still very intriguing. 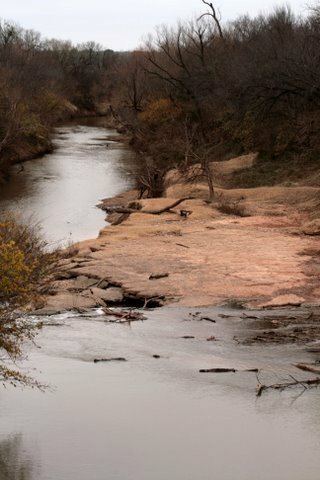 The thick undergrowth and the cold water below discouraged me from trying to see the underbelly, but I was satisfied to walk it and take pics. 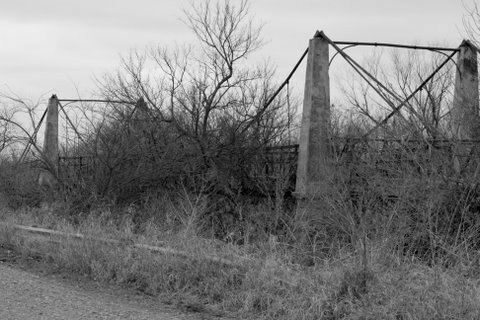 As best I can tell from a county road map (no sign at the site says so) both of these bridges, the old and new, cross the Clear Fork of the Brazos.